THE WRITING BUDDHA - Opinions | Books | Movies: The Leadership Sutra by Devdutt Pattanaik (Book Review- 4.75*/5) !!! 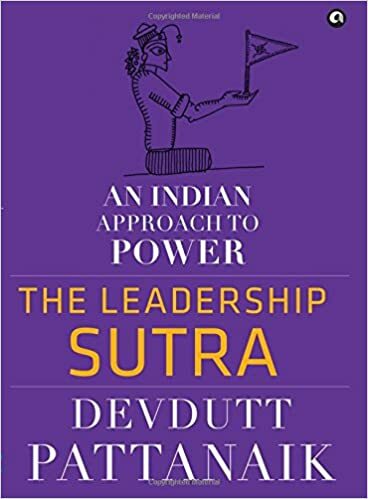 The Leadership Sutra by Devdutt Pattanaik (Book Review- 4.75*/5) !!! This new genre that many learned authors are exploring these days where they are using history and its events to make us understand how to grow in today's competitive and corporate environment is my new favorite. Another book that I just read of the same kind is Devdutt Pattanaik's latest release "The Leadership Sutra". The tagline of the book is "An Indian Approach To Power". The book definitely does justice to the tagline and title. Devdutt Pattanaik has this wonderful propensity of writing difficult books in such an easy language that makes naive people like me also understand the topic. The diagrammatic representation also makes it easy for the reader to understand the basis of the chapters if in case he is unable to decipher the real motive behind which the whole chapter is written. The Sanskrit terms that Devdutt has used throughout the book has been explained in the end of it. The book consists of four different types of Leadership Sutras named Significance, Property, Rules and Stability. Each of these sutras consists of several chapters. Each chapter has an example of Indian mythology either from Mahabharata, Ramayana or Vedas. It is interesting to read a chapter starting with an event described appropriately from history as it's written in a very crisp manner. After that, author explains the consequences of why a character from mythology took that decision and connects it with current scenarios which makes it easy for us to understand how to deal with the same kind of situation next time when we are stuck with it in our firm. In the end of the chapter, an example from the current corporate scenario is shared with which you can relate yourself or any of your colleagues. And each chapter has a diagram which is an icing on the cake. The easy language, wonderful narration, nice examples, short chapters, live scenarios makes this book a perfect in its genre. The publishing quality is also great with hardcover binding. But the only factor that will resist readers from picking up this book is its MRP i.e. almost 400 bucks. Spending Rs. 5 on each page is too costly for a reader. Though the target audience of this book will surely invest in it but to make it reach among the pass-outs and young professionals, the cost should always be taken care while releasing the first edition. Rest, this is a book which should be read slowly and each of its sutras should be implemented in our professional and personal life as it will surely develop you into a great leader. I give this book 4.75* out of 5.